The issue of bad weather isn't new. In fact, since mankind began keeping track of such things, rain has always been included in the bad weather category. Rainy days tend to be indicative of the season, "April showers, bring May flowers." Or the Autumn rain that feels cold and carries with it promises of a colder more slippery precipitation to come. Either way, rain is guaranteed to do one thing if you're caught in it: Get you wet! But wait, we have rain jackets for that, right? Well yes ,we do, but what do you know about your rain jacket? Where were the raw materials grown and through what process? Where were those raw material turned into yarn and thread? Where were they dyed? Where was the cloth sown, and the cutting and sewing done? Yes, there are a lot of questions we should be asking ourselves about the origin of our clothing. Luckily, we've met a husband and wife duo who has us covered in the rain jacket department. Maybe the best part, they want us to know everything there is to know about their process, supply chain and materials. Lauren and Nate Morgan, a husband and wife team, recently created the Lauren Morgan Co., a business focused on designing an American-Made rain coat of the highest quality and design. They live on Martha's Vineyard, a beautiful island off the coast of Massachusetts. As a New Englander, I can attest to the point that the rain in New England can be bitter cold and downright miserable. Even those April showers can be very cold still, and yes I've seen snow fall in April. However, their design and thoughtfully produced materials help to alleviate many of these rainy day problems. It's always a pleasure to spotlight businesses who are eager to transparently walk us through their process. Today we're chatting with Lauren, and couldn't be happier to tell her story. First, we have to ask the 'why.' 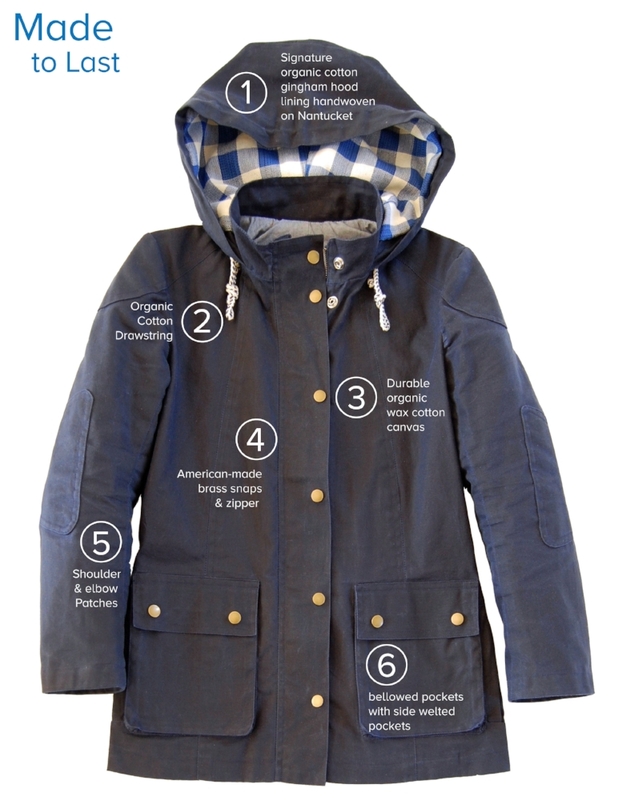 We know finding a good rain jacket can be difficult, but what made you want to venture out and design your own coat? What’s the heart and soul of Lauren Morgan Co.? We are at a pivotal moment; out of control apparel production is wreaking havoc on human life and the environment. Global supply chains are untraceable and American manufacturing has all but disappeared. We believe there is a vital connection to the people and places that make our clothes. We want to shed light on the craft and skill in our country’s textile manufacturing and protect the people and environments that make our clothes. Your transparency is so great and we love to see companies willing to put it all out there for the consumers. We would love to hear more about the supply chain and where the raw materials are coming from and what road they take to the finished product? For example what state is the genesis of the coat and what route does it take from there? Our organic cotton is grown in the South Plains region of Texas. In small batches in North Carolina, the raw cotton is spun into yarn and woven into the unfinished canvas. The canvas is then dyed in South Carolina using Global Organic Textile Standard (GOTS) dye and treated with an all-natural wax blend of non-petroleum and non-perfluorinated ingredients. 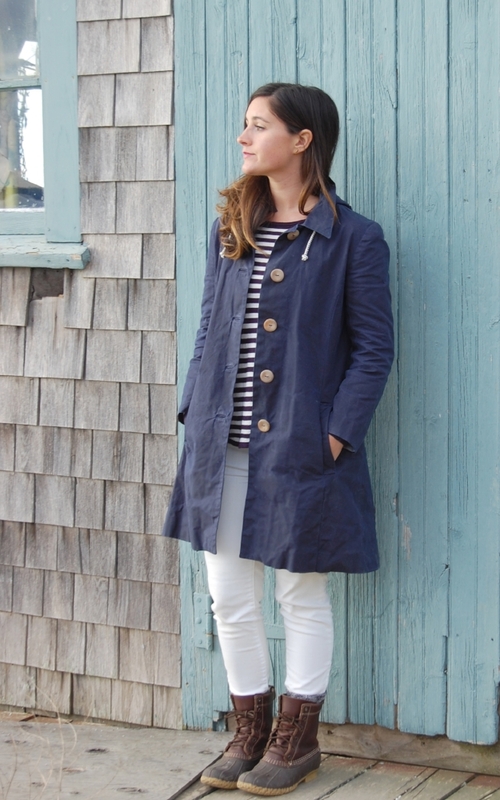 The trench's wood buttons are turned with Maine-grown birch in a family & veteran owned shop in Brooklyn, New York. They plant three trees for every two trees cut. Our antique brass snaps and grommets are made in Connecticut and the zippers are made in a Georgian factory using all American made materials and components. The chambray lining is woven in California by a veteran-owned mill on vintage American-made machinery with Texas organic cotton dyed with GOTS dye. For our signature hood lining, we collaborated with Nantucket Looms, a 50-yr old hand weaving studio, to weave bright blue gingham with our organic cotton. The character of the fabric brings to life our mission of quality craftsmanship & collaboration rooted in tradition & heritage. 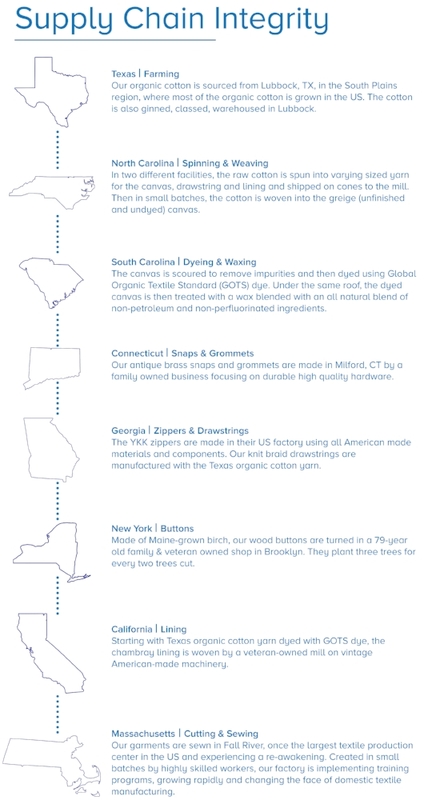 Our jackets are sewn in Fall River, Massachusetts, once the largest textile production center in the U.S. Created in small batches by highly skilled workers, our factory is growing rapidly and changing the face of domestic textile manufacturing. We live in South Carolina where the climate can be unpredictable! Is this a coat that could be used in various climates and temperatures? The rain jacket is fully lined, but lightweight so it can be worn in almost all rainy weather down to around 40 degrees. I am still wearing mine in December layered with sweaters on the warmer days in the Northeast. Our designs take you through those days that start drizzly, turn sunny, and end cold and rainy. Life is so unpredictable! Outerwear should be flexible and work with your schedule so you’re ready for anything. This jacket is extremely very fashionable, tell us a little more about your experience in the fashion industry? I (Lauren) graduated from the University of Cincinnati College of DAAP (Design, Architecture, Art, and Planning) with a fashion design degree. The school is known for its co-op program, which alternates school with internships so we were able to experience designing for multiple companies. The internships were in creative and technical design so I learned about both sides of the field. After moving to Martha’s Vineyard, I designed one-off custom garments for clients, created a collection of resort dresses, and designed a line of packable windbreakers and sold them at the Chilmark Flea Market on the island. We see that you have four total designs as of right now, two for men and two for women. Can you give us a rundown of the differences between the noreaster and downeaster? The Noreaster jacket is an updated single-breasted trench with wood buttons and a classic relaxed fit. The men’s Noreaster is hip length, while the women’s version is just above the knee so it can be worn with dresses. The Downeaster jacket is a utility jacket featuring side pockets, elbow patches, zipper closure and snapped plackets and bellowed pockets, and a sleek fit. 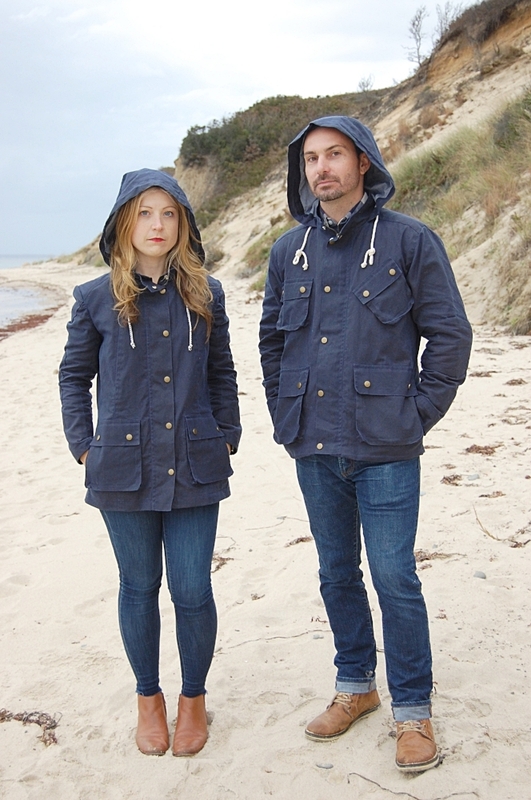 All the jackets have hoods lined with our signature lining handwoven by Nantucket Looms. 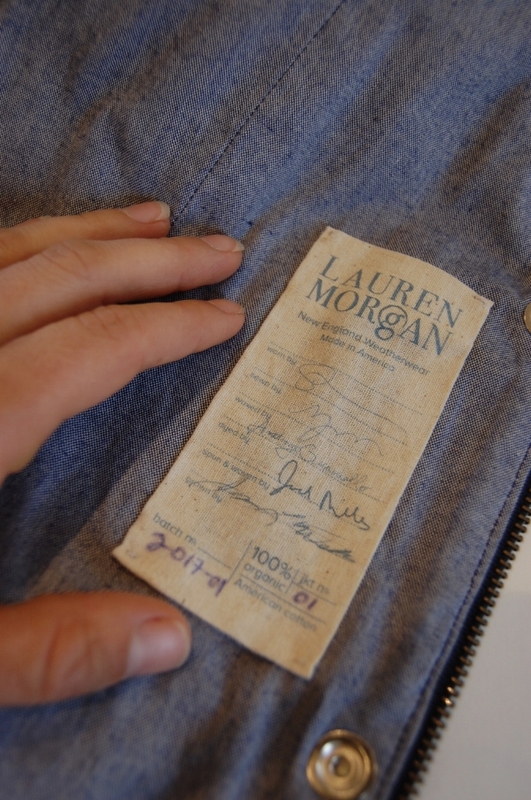 After a rain coat, what would be the next thing for the Lauren Morgan Co.? We would love to add a waxed cotton vest, parka, and baseball hat to the line up! And finally, how can people preorder this beautiful coat and when can they expect to receive it? The jackets will go into production in January and be ready in Spring 2018, just in time for rainy weather. What an incredible story that Lauren and Nate have. What they're doing is yet another example of a company truly looking to set, what should be, an industry standard. Compete supply chain transparency and totally openness about what they're doing and why. Not to mention the wonderful leaps and bounds American Made companies are doing to bring back American manufacturing to include textiles! This is so exciting to us and we really want as many people as possible to hear this story. Please check out Lauren Morgan Co. and spread the word!